Journal Journey and Joy! : I will talk about European referendums which I did fieldwork. I will talk about European referendums which I did fieldwork. I came back to Japan 2nd Dec. While I'm in Japan I will speak about the referendums which I saw with my eyes. 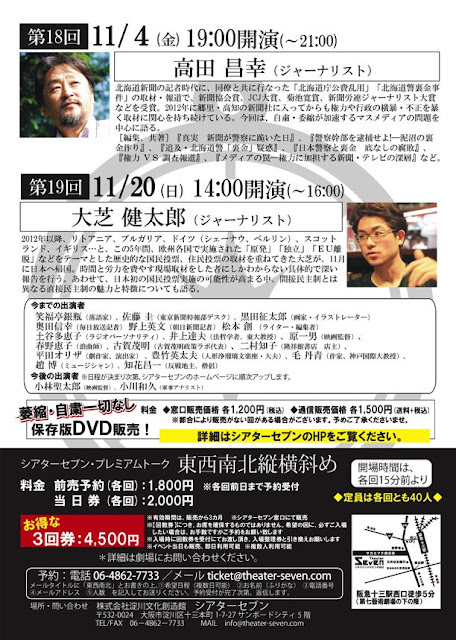 I got the first chance to speak it for public on 20th Nov in Osaka. I stay in Japan until the end of February. I will make a chance like this event many times. "North, South, East and West"
The press and expression are getting more self-restraint unfortunately in recent years in Japan. So we should counter against self-restraint. The event doesn't have any taboo. Hajime Imai, who is Journalist, invite guests and talk about topics which suit for guests, for example, Politics, Economics, Culture, Entertainment, Social problems, or Media. Since 2012, He reported about referendums which held in Lithuania, Bulgaria, Switzerland, Scotland and the UK. In this 5 years, he saw historical referendums about Nuclear Independent or Leaving from the EU. Japanese will face the first referendum to change the constitution. We should start talking about direct democracy (referendum), not only indirect (election) one.